Nepali rescue workers gather around the debris of an airplane that crashed near the international airport in Kathmandu on March 12, 2018. Photo by AFP/Prakash Mathema. There were 71 people on board the U.S.-Bangla Airlines plane from Dhaka when it crashed just east of the runway and skidded into a nearby football field. Officials said there were 71 people on board the U.S.-Bangla Airlines plane from Dhaka when it crashed just east of the runway and skidded into a nearby football field. "It should have come straight but it went in the other direction," said airport cleaner Sushil Chaudhary, who saw the crash. "I was worried it would hit another aircraft, but the pilot pulled the plane up. But then it crashed towards the field." 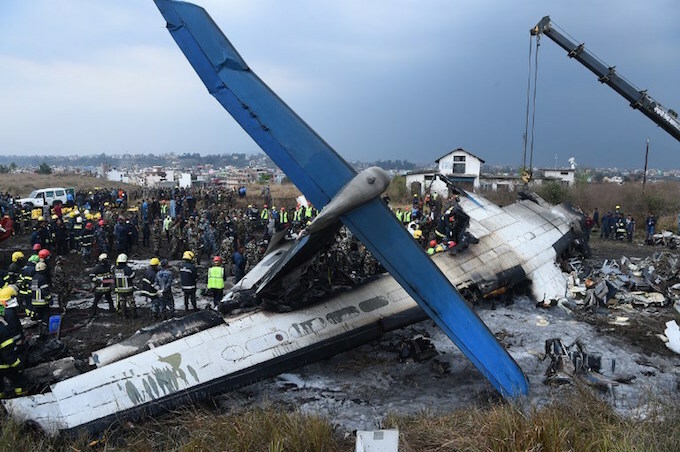 The plane was a Canadian-made Bombardier Dash 8 Q400 turboprop, Mahbubur Rahman of Bangladesh's civil aviation ministry told AFP. Other sources said the aircraft was 17 years old. "There might be technical problems on the aircraft. But it has to be probed before making a final statement," Rahman told AFP. It is Nepal's only international airport and experts say the surrounding Himalayan landscape makes it testing for pilots coming into land. Nepal's poor air safety record is largely blamed on inadequate maintenance, inexperienced pilots and substandard management, and its planes are banned from flying in European airspace. Accidents are common, hitting the impoverished country's vital tourism industry. In early 2016, a Twin Otter turboprop aircraft slammed into a mountainside in Nepal killing all 23 people on board. Two days later, two pilots were killed when a small passenger plane crash-landed in the country's hilly midwest. U.S.-Bangla Airlines is a private carrier that launched in July 2014 with the motto "Fly Fast Fly Safe", according to its website.